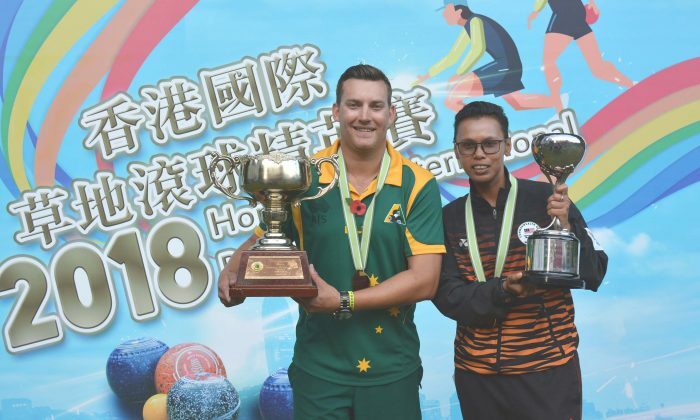 HONG KONG—Australian Benjamin Twist completed his collection of the Hong Kong International Bowls Classic titles by winning the men’s Singles last Sunday, Nov 11. Twist won the Classic Pairs with teammate Jesse Noronha and finished as runner-up in the Singles last year. Noronha also returned home with the Classic Singles title. 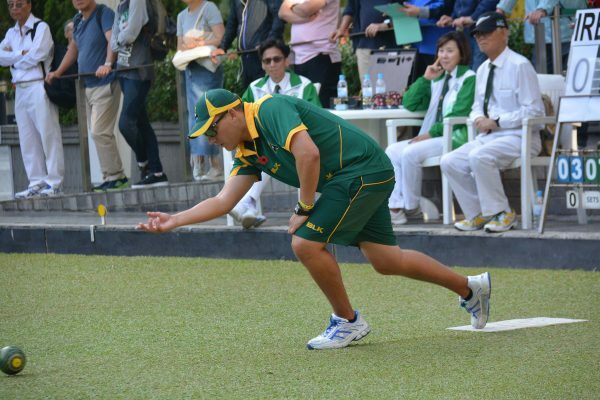 He defeated Wilson Lau (Kowloon Cricket Club), Andrew Furye (Scotland), Philip Chan (Kowloon Bowling Green Club), Ian McClure (Ireland) and Lui Chin Hong (Craigengower Cricket Club) to reach the final against another Irishman Aaron Tennant, who defeated the defending champion Noronha in the third round. Twist narrowly prevailed in the first set when Tennant’s last bowl was a bit too heavy and failed to draw another shot to tie the set. Twist’s firing shot saved him some of the ends however it was not enough to stop Tennant from taking the set 9:4. In the extra game, Twist continued with the same tactic. When Tennant had a bowl really close to the jack, he drove the jack into the ditch and won two in the first end. In the second set, the same tactic did not work as he slide the jack to Tennant’s bowls and lost two. In the last end, Tennant accidentally pushed Twist’s bowl into the head with his second bowl. He tried to take it out and despite hitting the target on both attempts, the bowl stayed and Twist won the title. “The final is a really close game and Aaron played very well. I came up with some great bowls in the right time and I believe it was the drives that won me the match. Drive is an important part of the game particular here because you cannot always outdraw your opponent, it was nice to be able to find another way of winning,” said Twist. The women’s singles was an all-Malaysian affair when 2014 Classic singles winner Siti Zalina Ahmad took on her teammate Emma Firyana Saroji. They have partnered to win the pairs gold in the Commonwealth Games, Asian Championship and SEA Games this year. Firyana defeated Vivian Yip, the defending champion representing Hong Kong Football Club, in the semi-final. Zalina took the first set 13:3 and Saroji came back in the second set to win 10:1. In the extra set, Zalina displayed the composure to take five shots in the first two ends to kill the game. She wants to make new history with Firyana to win more pairs titles and the next one on the agenda is the Classic pairs, a title she won with Nor Hashimah Ismail back in 2008. The Classic Pairs started on Monday and will finish this Sunday with play at Craigengower Cricket Club, Hong Kong Football Club and Indian Recreation Club. Same as last year, the finals are live on YouTube: http://www.hklba.org/live. 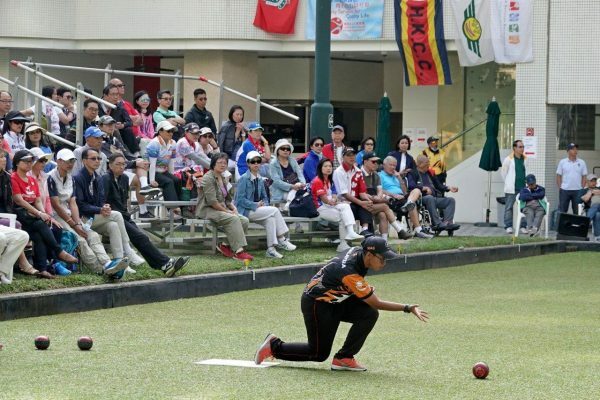 The Hong Kong International Bowls Classic will continue this week at Craigengower Cricket Club, Hong Kong Football Club and Indian Recreation Club. The final will be at 10:00 am and 2:00 pm on Sunday, Nov 18, at Craigengower Cricket Club.